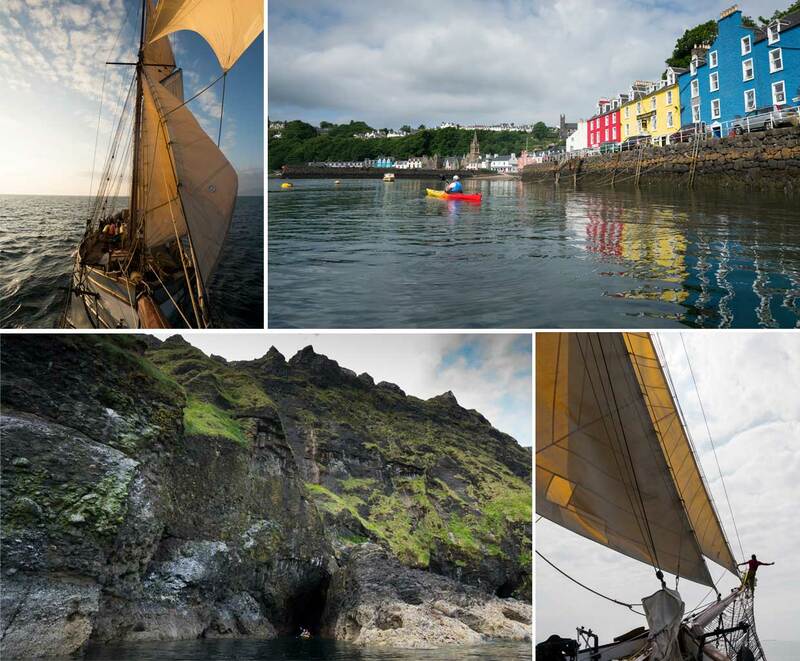 WHAT TO EXPECT Sail between wild islands, explore sea caves and sheltered coves by sea kayak and enjoy the hospitality and tradition of a classic tall ship on this sailing holiday with a difference. This is a superb chance to explore fascinating and wild islands off the West coast of Scotland aboard a traditional sailing vessel - enjoy taking an active part in the sailing or just sit back and watch for Minke Whales and Common Dolphins. 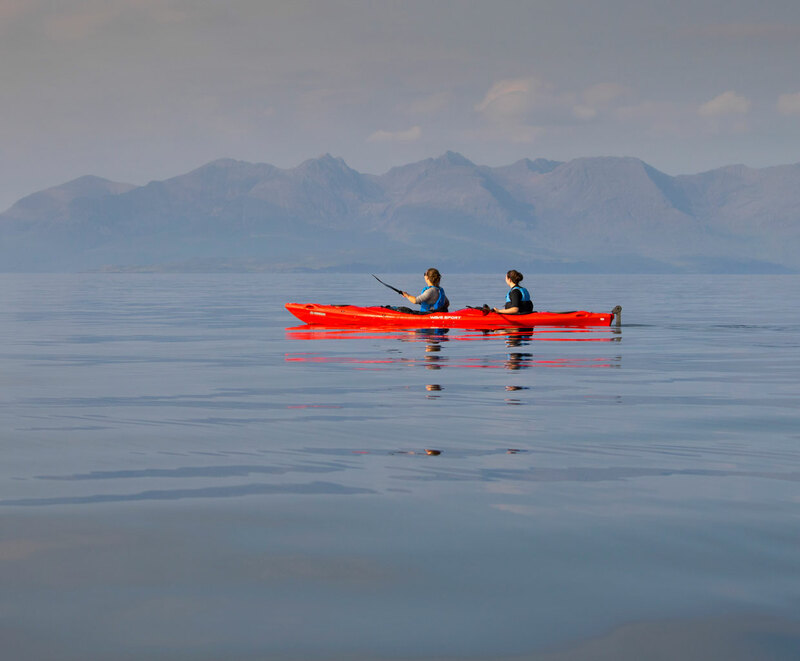 This is a journey to savour as we combine sailing, walking and kayaking to explore unique and beautiful islands. On this trip we will carry double kayaks on board our mother ship, the sailing vessel Irene, paddling sections of the coastline of the islands. The journey begins and ends in Oban, we explore anywhere around Mull, Coll & Tiree or the Small Isles depending on the wind. TRIP HIGHLIGHTS An eight day explore trip around the inner Hebrides, setting off from Oban, sailing on board the tall ship Irene. Explore wild islands full of individual character and history. Stay on board Irene in comfortable cabins with excellent home cooked food. Explore the islands on foot and paddle coastal journeys in stable and easy to handle double sea kayaks. DATES AND PRICES 8 Days | £1295 per person | food included | scroll down for full details. Please get in touch if you are interested in joining this trip in 2020. *A SAILING HOLIDAY ON BOARD SV IRENE - We'll meet in Oban on the evening of day one, after our introduction to Irene we'll settle in for a night aboard. The next morning will see us sail up the Sound of Mull towards the Isles, we'll keep a watch for Common Dolphins and Porpoise as we head up the sound. The wind direction and strength will dictate the nature of the trip - the course we follow for the week and the balance of sea kayaking and sailing. There are lots of possibilities and we can explore more sheltered sea lochs or head out into open water and explore the Small Isles. Irene is a comfortable ship and we'll enjoy spacious cabins and communal areas on board and the ships cook will prepare wonderful meals each day - more information on hospitality on board. 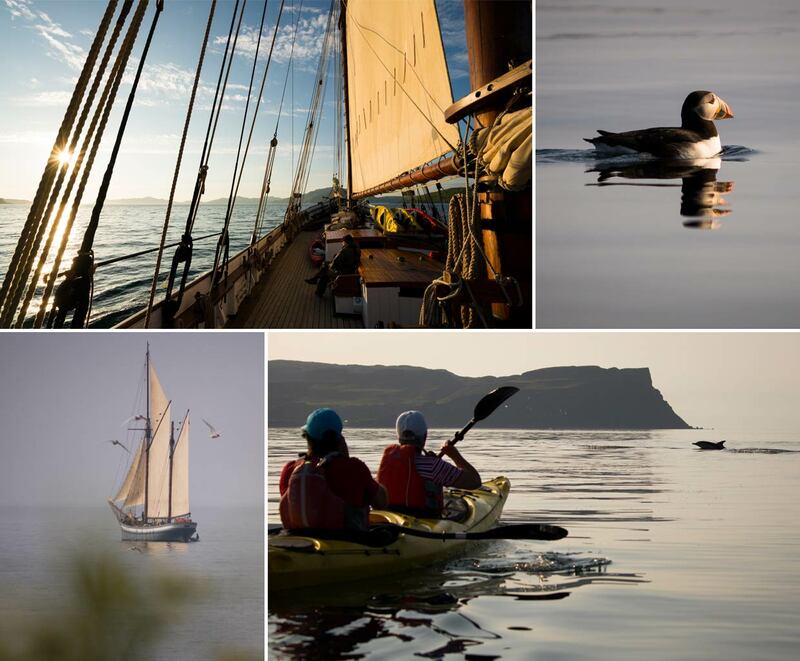 *EXPLORING THE INNER HEBRIDES - Over the course of the next few days we'll explore the islands as we see fit - sailing between them on Irene, launching the kayaks for coastal journeys or landing and exploring on foot. The conditions will dictate where we go and what we do - we have an expert knowledge of the seas around the islands and know all the best spots to explore - hidden sea caves, sheltered coves and remote beaches. We'll sail back to Oban on the penultimate evening of the trip, ready to say our farewell to Irene on the morning of the last day. 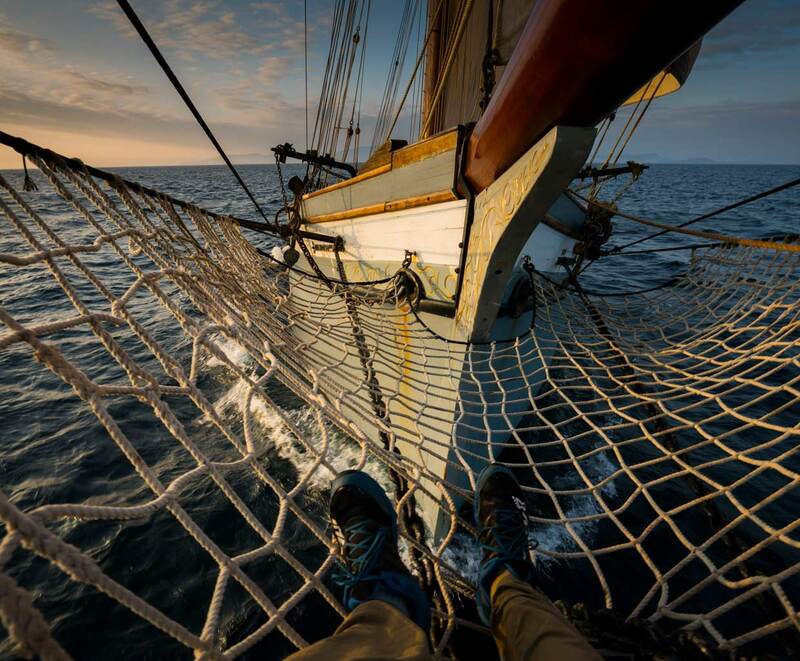 You'll get the chance to take an active part in sailing, or just it back and enjoy the journey. Irene is over a hundred years old and has a fascinating history. £1295 per person, includes guiding, equipment, accommodation on board and food. For this trip we will be staying on board Irene in en-suite cabins. Standard cabins have three berths in each. One double berth and one single. The single is situated above the double. Despite the three berths, we only ever sell two places in each. This allows us to host a couple sharing the double berth or two single guests in the double and single respectively. Please be aware that solo guests may be asked to share the cabin with another solo guest. We never mix sexes for solo travellers sharing a cabin unless we have cleared it with both parties first. On this trip we will use double kayaks. Includes all meals during the voyage. More information on Hospitality on board. Meet at Oban 17.00, finish Oban 10.00. 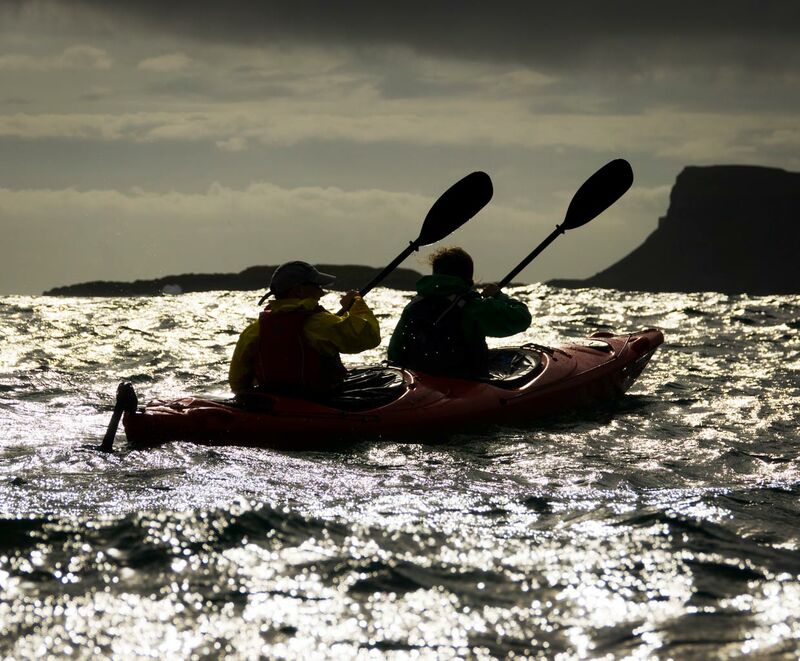 Do I need sea kayaking experience? No - this trip is graded green and is suitable for beginners. Will I learn sea kayak skills? A lot of learning about sea kayaking comes from experience and is best done as individuals on the move and in context. We won't spend time on long instructional briefings or static group skills practice but will give you little hints and tips on the journey to make it easier for you and suggest improvements to your technique as we go along. 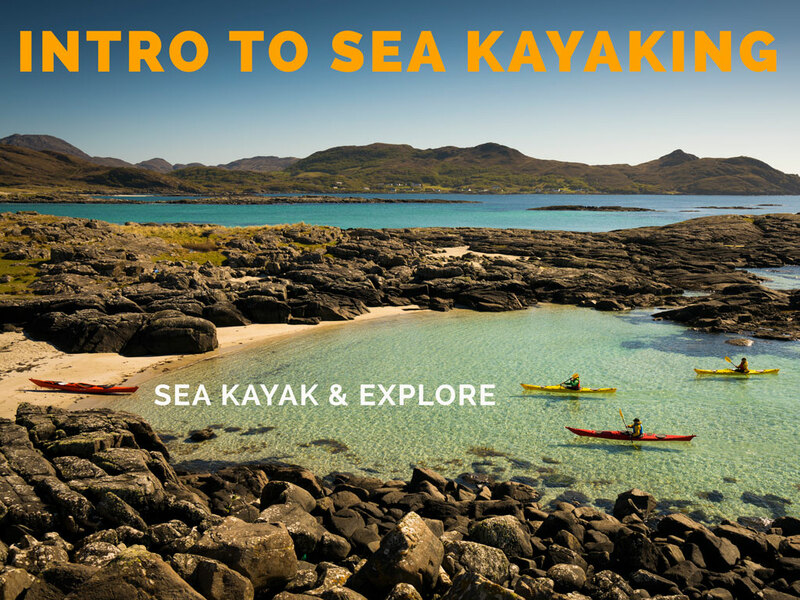 We'll help you develop your knowledge and sea kayak handling skill throughout he 2 days but also allow plenty of time simply to enjoy the journey and the experience of sea kayaking. The weather on the West coast of Scotland can vary through the course of the season and from area to area - Scottish islands and coastline can see dramatically better weather and more sunshine than more mountainous areas inland. The wind speed and sea state are the primary factors that affect the trip - if the conditions are difficult then we won't go out on the sea or may do a shorter journey. If we can't go sea kayaking then we'll offer an alternative activity such as a coastal walk or indoor session on sea kayaking knowledge. You should note that it is very rare that we have to stay off the water on multi-day trips and the vast majority of trips run as planned. For full terms and conditions see the link below. You can read more about the weather/cancellation/booking on our FAQ page. Full terms and conditions regarding booking our trips can be read here.